The British Bulldog is held as a lasting symbol of Britain, with the image of this resolute dog having been widely used on posters during the second World War and its subsequent association with the Prime Minister of the time, Sir Winston Churchill. 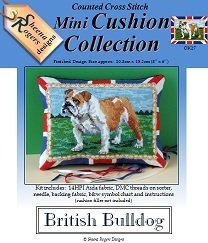 In this design, the strong Bulldog is surrounded by rich green land and wispy blue sky, framed by the colours of the Union Jack flag. Only whole cross stitch is required to stitch this design.